Monster Audio's ClarityHD are a fantastic gift idea for any traveler or commuter. Out of the box the headphones need to be charged before being turned on and connected to a device with bluetooth. The stylish design is also comfortable and sleek. The true amazement comes with the sound quality that is incredible from the first time used. While reading the instructions that come with the headphones it says that they only get better with some time. Listening to audio on low audio levels still provides a clear sound with natural and sound dynamic sound profiles. The cushions provide a much more comfortable fit than other on-ear headphones. The cushions all around the headphones make it for a snug fit. The headphones even when pushed to maximum audio levels do not distort the sound, rather the sound stays clear. The battery life is another great feature as it can last for a long amount of time. While in use they lasted as much as 20 hours and with regular use, on standby and in use, the headphones lasted seven days without having to recharge. The microphone could be much better. There were complaints that it sounded muffled sometimes and then other times that it sounded soft. It does however serve its purposes. Overall, the Monster Audio ClarityHD on-ear wireless headphones are well worth the $179.995 price tag. The comfort, style and audio quality are the reasons to buy these headphones. Available at Walmart, Walmart.com and Monsterproducts.com. 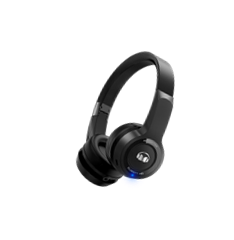 DISCLAIMER: The ClarityHD On-Ear Wireless headphones were given at a discounted price or free by monster Audio for review purposes. The review is still an honest review by the writer, no payment was given to influence the reviewer.